CW Research Ltd is an online publisher serving a global readership with its four products; Chemical Watch, AsiaHub, BiocidesHub and Chemical Risk Manager. Since its inception in 2007, the company has grown to become the authoritative source for news, analysis, research, events and training on chemicals risk and regulatory management. CW Research provides the global business community with the information and perspectives it needs to achieve safer chemicals in products. 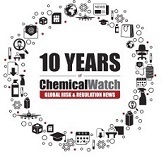 We are delighted to announce that this year, Chemical Watch is celebrating its 10 year anniversary. In this time, we have worked closely with the chemical regulatory and compliance community, informing businesses globally on product safety. When our company was founded in 2007, we could hardly foresee our growth to an international company within ten years. We could not have come this far without the loyalty and support of our subscribers and attendees of our events. For this, we wish to express our sincere thanks and appreciation. "10 years of informing businesses globally on product safety"
Chemical Risk Manager is an exciting new online publication designed specifically to support professionals managing risks of chemicals throughout the supply chain, delivering essential news and resources to help them with their practical challenges. Chemical Risk Manager covers science and testing, data submission, supply chain communication, occupational health and the needs of downstream customers - everything in one place, saving valuable time and a cost-effective investment for regulatory compliance, occupational health and chemical safety teams. AsiaHub is a specialist resource, providing the professional regulatory community with our most in-depth, focused insight into the chemicals regulatory agenda. AsiaHub keeps you on top of emerging legislation, gives advance warning of key developments and offers practical guidance on managing Asia regulatory change within your organisation. BiocidesHub offers the professional biocides community invaluable insight into regulatory developments affecting products used to control biological hazards. It gives subscribers a 360-degree view of business critical issues through daily news coverage, complimented by a well-stocked resource library including policy documents, guidance and standards, case studies, databases and more. Originally founded by Julian Rose and Mamta Patel, CW Research now employs 40 people at locations across the UK and North America. View the whole team. CW Research Ltd has grown from the initial modest investment made by its two co-founders with their own funds and just a few committed people in 2007, into an organisation with a staff of 40 people in 2016. We have journalists, researchers and contacts across the world helping us to get the best information to businesses. Whether you read our news, use our resources or attend one of our training courses, webinars or conferences, you can be sure that we are tapping our network to provide you with the wisest and most respected advice we can find. The vibrant global online sites you see today with their agenda-setting news services, resources, events, directories, databases and other essential tools began as a simpler news service. Our aim in 2007 was primarily to help businesses to comply with what was at the time described as the most complex law the EU had adopted, the EU REACH Regulation. Having covered the protracted negotiations leading to adoption of this law, with its goal of managing the safety of the most commonly used chemicals found in products throughout supply chains in the EU market, we recognised the worldwide impact that the legislation would have. What we could not have predicted was the unprecedented speed with which other regions have moved to modernise their chemicals legislation. Our readers requested that we track developments throughout these regions too, helping them to comply, and so we rose to the challenge, widening the area of our coverage year on year, starting with those countries in which there was most regulatory activity. From the start, we have been fiercely protective of the independence of the information we provide. We have no ties and no consultancy offering, nothing to sell but our information. We ensure we give a voice to all sides of an issue, including NGOs, civil society groups, regulators, politicians, consultants, lawyers, scientists and businesses small, medium and large with a myriad of viewpoints. We also seek views from within and outside each jurisdiction to give a holistic picture of the impact of chemical risks and regulatory activity. No other organisation can ask the questions we do with the objectivity we apply. The chemicals risk management agenda involves every part of society, leading to challenging and evolving economic, scientific, sociological, political and geopolitical arguments. Chemicals, like food, water and energy, are an intrinsic part of everything we do. This is what makes it such a challenge to stay ahead of and get it right. This is why there is a worldwide agreement - a shared action plan - to manage the risks of man-made chemicals, while harnessing their benefits, and this is also why progress toward these ends is so closely linked to countries’ economic development. The sound management of chemicals is now an explicit target in the UN’s 2030 Agenda for Sustainable Development. We understand we have a long way to go and remain passionate about providing businesses worldwide with the best intelligence to enable them to use, design and sell safer and more sustainable products.